Murano glass necklaces never go out of fashion. They are so colorful, whimsical and airy that they work with any fashion, fit any taste and go with any outfit. A simple Murano glass necklace can transform the plainest little black dress into a high fashion. 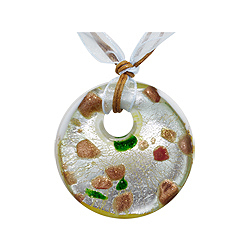 Murano glass necklaces can be worn with fur and cashmere or with ripped jeans and sneakers. And what is even more interesting, the same passion for Murano necklaces existed for the last five centuries. What is it about Murano jewelry that has such timeless appeal and it crosses all geographical boundaries? We can only guess, and everyone has his or her own theory, but the truth has to do with the combination of perfect craftsmanship, exquisite artistic vision and centuries of tradition that make Murano glass so unique and recognizable. There was a time when glass jewelry was more expensive and more coveted than the precious stones. Since the Egyptian times, making glass was so difficult that it was highly valued and owned only by royalty and very rich traders. Most ancient glass jewelry was made with beads and some beads survived to this day to show the craftsmanship of the glassmakers of old. Murano glassmakers perfected the bead making techniques and came up with many new ways of creating perfect tiny orbs in thousands of colors, shapes, forms and sizes. The art of making Murano glass starts with the creation of beads, each made by hand, in the centuries old tradition, with passion and craftsmanship that was never surpassed. But, making perfect beads is not the end of the art of making Murano necklaces. Placing beads of different colors and sizes together to form a perfect piece of jewelry requires not only the craftsmanship, but an eye of a true artist as well. Beads made in Murano are today one of the greatest exports from this ancient island in the Venetian lagoon. Artists and craft lovers all over the world import beads from Murano and use them to express their own artistic vision in creating glass jewelry. But, glass necklaces created in Murano are even more valued than the hand-made beads and are sought after by fashionable women in all parts of the world. Murano artists have centuries of tradition behind them to create the perfect play of beads and precious metals, crystal translucent beads and tiny orbs in all colors of the rainbow. Contemporary Murano does not only rely on tradition in the creation of spectacular glass jewelry. 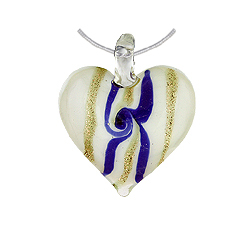 There are young Italian artists that build on that tradition and weave it with their own artistic talent to create magnificent pieces of glass jewelry that is at the same time modern, fashionable and instantly recognizable as Murano. The true value and beauty is timeless and never goes out of fashion. Murano necklaces that are centuries old are now sold at auctions for enormous sums of money. Those that women are buying today will one day become a family heirloom and be passed on from generation to generation.